Description: Designed with a cylindrical profile that fits into a broad range of settings, this Cilindro Mini Pendant evokes a striking aesthetic. The stunning Ambra Siena Idalight diffuser is complemented with hardware featured in a Brushed Nickel finish. Install these mini pendants in a row across an island, counter, bar or table for a complete designer look. 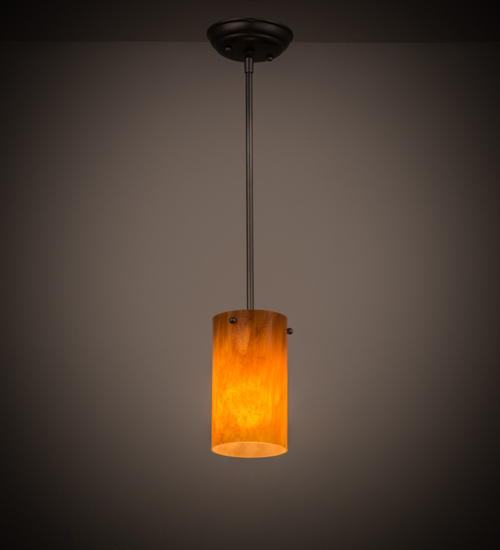 Handcrafted by Meyda artisans in the USA, this fixture is available in custom colors, styles and sizes, as well as dimmable energy efficient lamping options. UL and cUL listed for damp and dry locations.